A gentle giant, the Newfoundland likely descends from the mastiff, and possibly the Great Pyrenees, but beyond that, the history and dog or dogs to which it contributed to, or received DNA from, becomes a bit muddled. Undeniable, however, is the Newfoundland’s (affectionately known as the Newfie) work ethic – especially in water – and mild disposition. In the late 1800s, fishermen from England and Ireland ventured to North America and, on what is now known as Newfoundland in Canada, discovered two dogs inhabiting the island. The smaller now-extinct dog had a smooth coat and medium build, and was known as the Lesser Newfoundland or St. John’s Dog – it became the foundation stock of many of today’s retrievers. The larger, long-haired dog was essentially today’s Newfoundland, which has contributed to the evolution of the Saint Bernard, Bernese Mountain Dog and Leonberger. Both dogs were working dogs that were used to primarily haul nets for fishermen, but also as draft animals pulling carts and other labor-intensive duties. The necessary love of water influenced the evolution and use of both dogs. While the smaller version contributed to the genetics of several breeds of retrievers that were developed to pick up downed waterfowl, a task they’re still used for today, the Newfoundland dog itself gained fame and favor as a life-saver of sailors at sea in the north Atlantic. Today, the Newfoundland still retains its propensity to rescue swimmers, and is still employed as such. They have a calm and gentle disposition, which allows them to get along with other breeds and children. Newfoundlands are large dogs and can exceed 120 pounds and feature an extremely thick and oily coat, which served to keep it warm while rescuing sailors in frigid waters, that requires much attention and daily brushing. Their dominant color is black, but Newfies can also be found in brown or a black-and-white pattern, which is known as Lanseer. 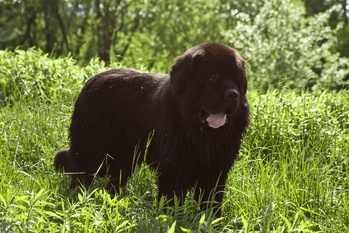 As giant breeds, Newfies have a shorter life span – typically 8 to 10 years. They are also prone to a few health issues, including hip and elbow dysplasia, as well as the heart defect subvalvular aortic stenosis. At Paw Print Genetics, tests are available that screen for the genetic mutations of alopecia and cystinuria found in Newfoundlands, as well as other dogs. •An unnamed Newfoundland is credited for saving Napoleon Bonaparte in 1815. During his famous escape from exile on the island of Elba, rough seas knocked Napoleon overboard. A fisherman's dog jumped into the sea, and kept Napoleon afloat until he could reach safety. •In 1828, Ann Harvey of Isle aux Morts, her father, her brother, and a Newfoundland Dog named Hairyman saved over 160 Irish immigrants from the wreck of the brig Dispatch. •In 1881 in Melbourne, Australia, a Newfoundland named Nelson helped rescue Thomas Brown, a cab driver who was swept away by flood waters in Swanston Street on the night of 15 November. While little is known about what became of Nelson, a copper dog collar engraved with his name has survived and 130 years after the rescue it was acquired by the National Museum of Australia and is now part of the National Historical Collection. •In the early 20th century, a dog that is thought to have been a Newfoundland saved 92 people who were on the SS Ethie which was wrecked off of the Northern Peninsula of Newfoundland during a blizzard. The dog retrieved a rope thrown out into the turbulent waters by those on deck, and brought the rope to shore to people waiting on the beach. A breeches buoy was attached to the rope, and all those aboard the ship were able to get across to the shore including an infant in a mailbag. Wreckage of the ship can still be seen in Gros Morne National Park. E. J. Pratt's poem, Carlo, in the November 1920 issue of The Canadian Forum commemorates this dog. •In 1995, a 10-month old Newfoundland named Boo saved a hearing-impaired man from drowning in the Yuba River in Northern California. The man fell into the river while dredging for gold. Boo noticed the struggling man as he and his owner were walking along the river. The Newfoundland instinctively dove into the river, took the drowning man by the arm, and brought him to safety. According to Janice Anderson, the Newfoundland’s breeder, Boo had received no formal training in water rescue. Image of Newfoundland courtesy of Alicja via Flickr.